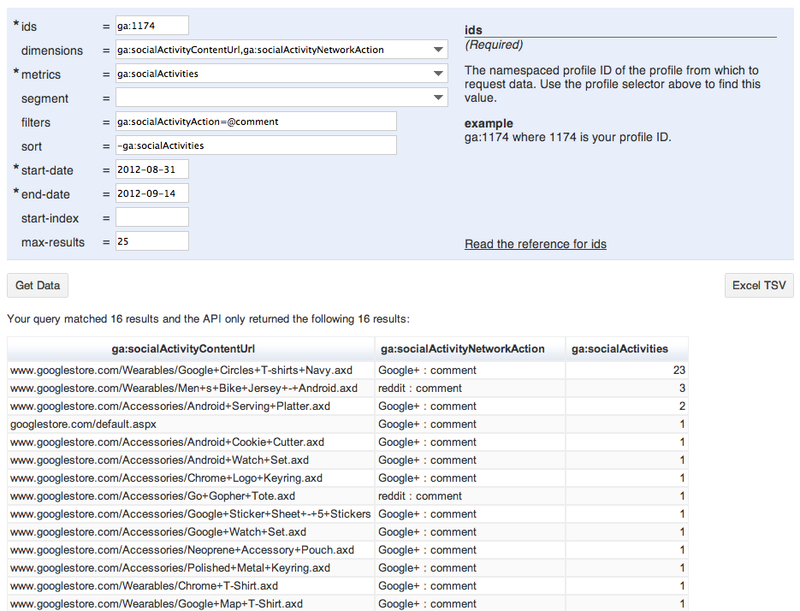 Google Analytics Core Reporting APIs enable a powerful and flexible way to analyze, report on, and ultimately optimize such things as web and mobile experiences, conversions, and sales. Today we’re adding over 40 new metrics and dimensions that can be queried through the Core Reporting API. This enables developers to create reports that are similar to what is available in the Google Analytics web interface for important areas such as social and mobile. See a full list of additions on the Core Reporting API changelog. Here’s a rundown of what’s new and a few helpful questions the data can answer. Now you can get data for both on-site interactions with social buttons as well as off-site social data from social data hub partner networks. Which content receives the most comments on social networks? What are the conversion rates for visits from social networks? For social buttons embedded in my property, which ones get used most often and for which content? For mobile visits to your site, get all the good stuff like like brand, model, and input type. What are the top 10 mobile devices used to visit my website? We added a new dimension to indicate the Designated Market Area (DMA) where traffic came from. What are the Top 10 Campaigns for the San Francisco Bay Area DMA? Create your own drill down reports with these new dimensions that allow you to roll-up metrics to hierarchical levels of your property. What does the performance of my website look like across different sections? If you’re using the Google Analytics SDK for iOS/Android v2 beta, you can now retrieve App View and Exception metrics. On a daily basis, how many views did my mobile app get? On a daily basis, how many exceptions occurred in my mobile app, and how many exceptions were fatal? New ways to report on all things related to user timing data. What were the time measurements for all user defined timings? Dimensions & Metrics Reference for a list of all available metrics & dimensions. 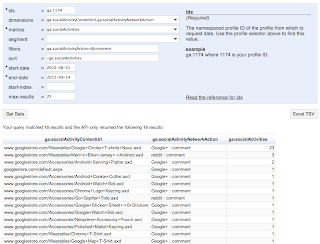 Google Analytics Query Explorer to help you build queries and try out the Core Reporting API. Core Reporting API changelog for a list of the 40+ new dimensions & metrics. Pete Frisella is a Developer Advocate for Google Analytics. He likes to travel and hit the golf course when he can.